@SpeakerRyan is exactly right. Rebuilding our military is most important issue in ongoing budget negotiations. Nothing else congress does will matter if we fail to provide our men and women in uniform with the resources they need to defend us. Representative Cheney is a true asset to Congress. She works hard, she is smart, dedicated and a thoughtful politician. She is going to do much good for our country. However, she and Speaker Ryan have genuinely failed to understand what makes a large defense budget possible. Providing for the defense of America is the most sacred constitutional obligation of the U.S. Congress. If Congress fails in this, no balanced budget, no health-care reform, no tax reform, no entitlement reform will matter. If lawmakers fail to provide the resources necessary for the defense of the nation, nothing else they do will matter. Again, we should all applaud and support her defense hawkishness. The problem is that the fiscal reality of the federal government stands in her way; unless she and Speaker Ryan recognize the reality of the federal budget, their quest to grow defense spending is reduced to pure sophistry. It was easier to prioritize defense spending back in the days before the egalitarian welfare state began its conquest of America. In 1962, 55 years ago, the Department of Defense claimed almost half - 49 percent to be exact - of the total federal budget. As President Johnson rolled out the War on Poverty, his egalitarian master project, defense spending was gradually pushed aside as other priorities took over the federal budget. 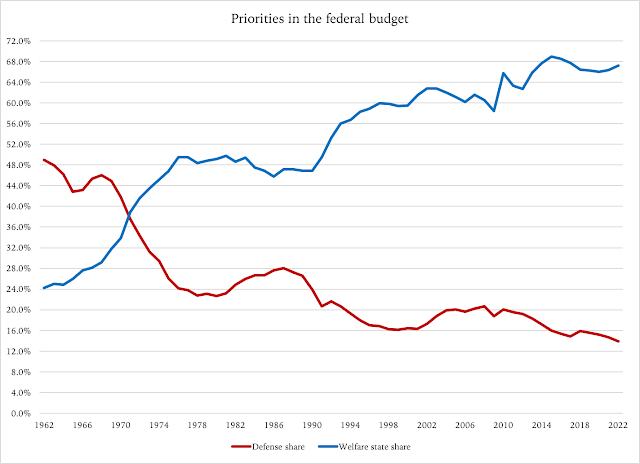 Today, defense spending is about 15 percent of the total federal budget. Representative Cheney, in addition to her resistance to reforming entitlement spending, has a voting record that suggests she is in favor of protecting our largest entitlement programs. Contrary to what they think, Congress cannot leave entitlements unreformed and still have more room for defense spending. As we just saw, two thirds of the federal budget go toward economic redistribution among America's families, while less than one in six dollars that Congress spends go toward national defense. It is naive to think that you can increase the 15 percent of the budget without doing anything about the other 85 percent, most of which, again, is welfare-state spending. In 1962 Congress spent 49 cents on the welfare state for every dollar it spent on defense. In 2017 Congress spent an estimated $4.57 on the welfare state for every dollar of defense spending. There is a common driving force behind America's entitlement programs: redistribution. Those who are entitled to receiving cash or in-kind services from government are entitled to them in parity to median household earnings. Since median household earnings evolve over time, so does welfare-state spending. Furthermore, some products provided by government in the form of in-kind entitlements, will come with their own built-in cost drivers. Health care is the best example. Historically, inflation in health care products has been about twice the regular inflation rate, and so for good reasons. Health care is a technologically complicated product, and the education of health professionals is increasingly demanding. Unless Congress is going to starve Medicare and Medicaid enrollees of quality health care, they have to increase spending at a certain rate each year. As Figure 2 explains, the growth rate that is built into our entitlement programs is high enough to surpass the growth rate in defense spending on a regular basis. 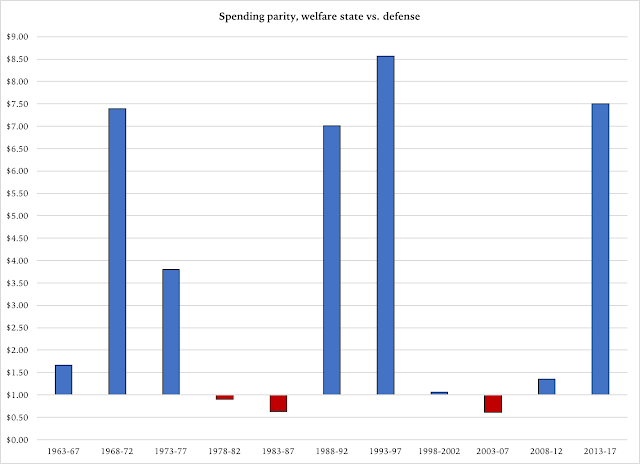 Just as an example of what this means in practice, if defense spending had grown on par with welfare state spending over the past ten years, the defense budget would have been 50 percent larger today than it actually is. The question, of course, is where those extra $300 billion would have come from. Assuming that Speaker Ryan and Representative Cheney do not want to add to the budget deficit, and given the tax reform they just got passed, they are inevitably going to have to re-prioritize existing government spending. They can do that without actually reforming entitlements, but given what I just explained about the spending-growth drivers in entitlements, discretionary cuts will only make a temporary difference. b) entitlement reform means replacing the egalitarian purpose of entitlement programs with a different purpose. In 1964, the War on Poverty replaced the old, absolute definition of poverty with a relative definition. Under an absolute definition, a person is poor when he is deprived of a defined set of commodities in his life; under a relative definition, a person is poor when his standard of living is below a certain percentage of the median-household standard of living. The former definition does not grow government spending unless Congress explicitly decides to grow it; the latter definition puts entitlement spending on a growth autopilot. 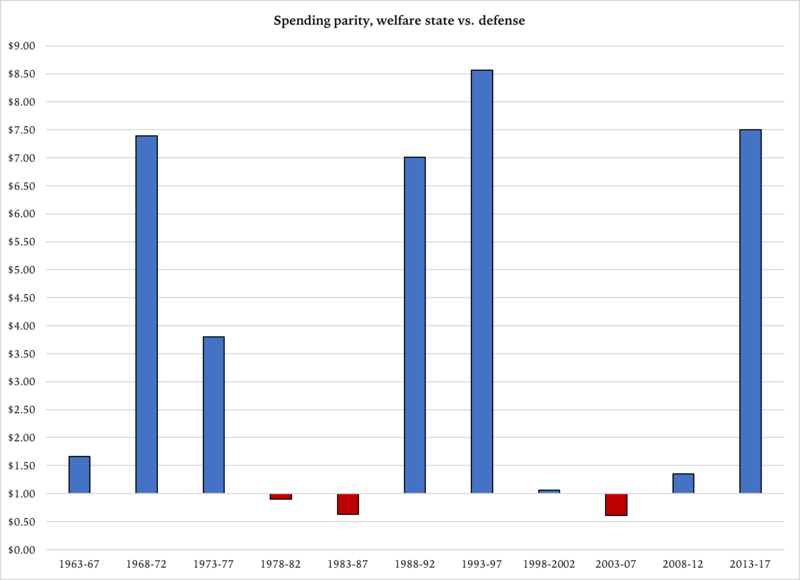 Until Congress decides to put an end to the era of the egalitarian welfare state, the two thirds (and growing) of the federal budget that is welfare-state spending will continue to grow faster than the 15 percent (and shrinking) that is defense spending. In lieu of tax increases (which we hopefully will never see in a Republican-led Congress) there is only one way to grow defense spending: stop the growth in our entitlements. With the ho-hum tax reform in mind, we cannot expect economic growth to do much of anything to help. It was necessary to prevent a full-scale economic stagnation, but far from enough to help put the economy on a higher growth path. At best, together with Trump's deregulation efforts the tax reform will delay the inevitable entitlement-driven budget crisis. But it will not provide that badly needed extra revenue that Speaker Ryan and Representative Cheney are going to need if they want to grow military spending without so much as touching entitlements.